Does your grout still look dirty and dingy, even after cleaning? Even once stunning bright colorful grout can begin to discolor from regular wear after a few years. Despite your best effort to thoroughly clean your grout, it can still look dark, old and worn. Certain grout pigments just don’t hold up, and can begin to look mismatched or worn in high-traffic areas. The easiest solution is to hire a grout specialist from Groutsmith to come in and color seal your grout so that it doesn’t look soiled. After years of wear it is a good idea to have a grout refreshing color done, to make your tiles look bright and new once more. Groutsmith can change the color of your grout to any color you want. Our proprietary acrylic resin color sealer minimizes the staining from dirt and spilled liquids and makes cleaning easier. By investing in a grout color sealing service, you can actually extend the life of your floors, walls and countertops. You can renew the look of your flooring, kitchen or bathroom with a new color or breathe life back into the old color palette. 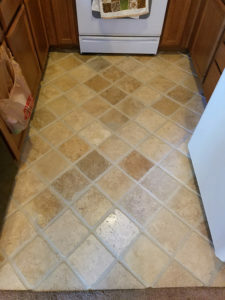 If you are tired of your grout, the Groutsmith can revitalize your tile and grout to look new once again. Contact Groutsmith Temecula Valley for demonstration and a free estimate on color sealing services.